Established in 2011, the Michigan State University (MSU) College of Law’s online Global Food Law Program prepares leaders to solve complex, practical problems related to the regulation of food. The Global Food Law program delivers a curriculum focused on the practice of law in food regulation. Delivered entirely online, the program is designed for professionals working in the food and agriculture industries, food safety, law, government, and other areas involving international food law with both lawyers and non-lawyers learning together. The master’s degree program gives lawyers, regulators and other food industry professionals the flexibility to earn their Master of Laws (LLM) or Master of Jurisprudence (MJ) completely online. The International Food Protection Training Institute (IFPTI) is improving public health by building competency-based training and certification systems and cultivating leadership for the food protection community worldwide. In order to address the emerging issues of a safer worldwide food supply, IFPTI was created in 2009. Based in Battle Creek, Michigan, IFPTI is a model for private-public partnerships that address public health needs and collaborates with industry, academia, federal, state and international governments, and other organizations. Through collaborations with organizations such as: the U.S. FDA; USDA; the Canadian Food Inspection Agency (CFIA); the World Health Organization (WHO); state and local governments, and many national alliances and associations, IFPTI has become a recognized leader in food safety. IFPTI’s core offerings for both public and private sector clients include: competency identification, curriculum design, training courses, instructor development, training records management, evaluation and development, and training quality assurance. Founded in 1946, the American Society for Quality (ASQ) is the leading global authority in the quality movement with members in more than 150 countries. Through ASQ’s Food, Drug, and Cosmetic (FDC) Division, professionals concerned with quality in their organizations have access to specialized training, information, benchmarking, and professional programs. Founded in 1960, the FDC Division works with the U.S. Food and Drug Administration and other regulatory agencies worldwide. Paster Training, Inc. is a privately held training company committed to educating and positively changing the food and beverage industry. The authority in both food safety and responsible alcohol management training, Paster Training works nationwide to help industry organizations and operations act smarter and safer. Paster Training inspires employees at all levels within each organization to internalize best practices through education from farm to fork and from grain to glass by offering innovation to the industry with a variety of trainings and products. Paster Training offers a full range of training and certification programs, consulting, and products for food safety, food defense, HACCP, Seafood HACCP, Alcohol HACCP, responsible alcohol management, and much more. For more information, visit www.PasterTraining.com. Superior Laboratory Services, Inc. is a drug-free, Texas-based company, owned by Rick Meyer. We have a State of Texas Professional Engineering License. Our staff are factory trained personnel with continuing education to provide superior services. Our owner, Mr. Meyer brings 30 years of experience, expertise and quality service to our company. Superior Laboratory Services, Inc. offers a wide variety of specialty services including biological safety cabinet, chemical fume hood, operating room, filter systems, cleanroom certification testing and air quality testing. Additionally, we provide installation, design and consultation for laboratories, pharmacies, cleanrooms and custom ventilation systems. We offer custom smoke testing and sterilization of any type or size of environment from cleanrooms to barrier facilities. We specially design contracts that include 24 hour repair or assistance. Our mission is to provide the highest quality, quickest response available utilizing the latest testing equipment and design. Our service is only limited to your imagination or needs. WinWam Software is fast becoming the standard in government field inspections. Thirty-two (32) State governments have purchased WinWam along with many county and city governments. WinWam Software provides inspectors with sophisticated and easy to use tools for performing a myriad of inspections including Food & Drug Safety, Meat & Poultry, Animal Health & Welfare, Dairy, Weights & Measures, Plant Industry, Apiary and more. WinWam Food Safety Software is available with a Designer module that allows jurisdiction to customize its own electronic inspection forms. With WinWam the inspection forms are turbo charged with intelligence. Responses on the form can trigger pop-up health code violations. The inspector can append notes, create flowcharts, and attach electronic documents and digital photographs. At the end of the inspection, the sanitarian can capture the store manager’s signature and print an inspection form in the field or back at the home office. WinWam Software is easy to deploy, proven and affordable. Please contact us to learn more about WinWam Software. NSF International is an independent, not-for-profit, public health and safety organization that develops accredited national standards for food safety, water quality and other environmental health related products, and additionally provides accredited conformity assessment services in the form of second and third party inspection, testing and certification services for products and facilities. NSF inspects facilities and certifies products in more than 80 countries. NSF also provides public health training and education services, and a wide range of ISO Quality and Environmental Management Systems Registrations. NSF is a World Health Organization Collaborating Center for Food Safety and Water Quality, and a U.S. EPA Center for Environmental Technology Verification (ETV). To learn more, visit www.nsf.org. The Safe Quality Food (SQF) program is recognized by retailers and foodservice providers around the world as a rigorous, credible food safety management system. It is the only certification system recognized by the Global Food Safety Initiative (GFSI) that offers certificates for primary production, food manufacturing, distribution and agent/broker management. This enables suppliers to assure their customers that food has been produced, processed, prepared and handled according to the highest possible standards, at all levels of the supply chain. Additionally as a division of the Food Marketing Institute (FMI), the SQF program incorporates continual retailer feedback about consumer concerns. This information is passed on to SQF certified suppliers, keeping them a step ahead of their competitors. Prometric’s food safety exams play a critical role in ensuring food service professionals have mastered the principles necessary to reduce risk to consumers. As one of the most respected and trusted sources of test development and delivery in the world, Prometric supports test takers worldwide who take more than 7 million tests each year on behalf of more than 300 clients in more than 180 countries. For additional information, please visit www.prometric.com. “USAFOODSAFETY is an enterprise system that consolidates food, health, and public safety information from state and local governments into a state-wide repository. It seamlessly integrates the workflow for licensing, mobile inspections, certification, recall & trace back, complaints, enforcements, laboratory sampling, and billing and accounting processes. There are four major components of USAFoodSafety: mobile disconnected inspections; a web portal for facilities to renew and apply for licenses; a web portal for citizens to view inspection reports; and an executive dashboard for near real-time visibility and trending of revenue, inspections, complaints and violations. 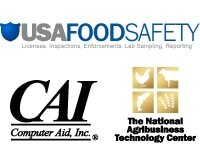 USAFOODSAFETY is pre-configured with over 100 business programs such as manufactured food, retail food, eggs/fruit/vegetables, seafood, milk, schools, swimming pools, hotel and the list is growing with each state and local government addition. PA has made the solution available to other state/local governments through the National Agribusiness Technology Center. The NATC is a non-profit entity that facilitates various activities such as enhancement requests and collaboration across the states. The NATC is responsible for licensing all AgraGuard modules, USAFOODSAFETY, USAHERDS, USALIMS, USAPlants, USAMeals and is currently implemented in over 31 states. Computer Aid Inc is the software implementer for the NATC that provides implementation services such as data conversion, project management, enhancement modifications, state specific rules and technical support. Sani Station is a unique cleaning and sanitizing system for kitchen serving utensils – tongs, chef’s knives, pizza cutters, serving spoons, etc. Help stop cross contamination and cross-contact of allergens with our propriety blended cleaner/sanitizer, pre-portioned packets in our patented scrubbing systems. Food safety is mandatory, not optional. The Food Protection and Defense Institute (FPDI), formerly known as the National Center for Food Protection and Defense, is a multidisciplinary and action-oriented research institute and consortium of academic, industry, and government partners that address the vulnerability of the food system to intentional and catastrophic contamination. FPDI takes a comprehensive, farm-to-table view of the food system, encompassing all aspects from primary production through transportation and food processing to retail and food service. Ceutical Laboratories, Inc. has one simple goal, COMPLIANCE SUCCESS OF THE CUSTOMER! We will not stop until we find the best solution to your needs. We are not the typical “you can’t do that”, but rather, when faced with a problem, we are the “you can do that this way”. You achieve the goal, but in a compliant way. We pride ourselves in finding compliant and easy solutions to the most difficult of tasks. Ceutical Labs offers many unique components for the industries that it serves. The market segments include Pharmaceutical, Nutraceutical, Medical Device, Cosmetics, and Veterinary Markets. Ceutical Laboratories provides Project Management, Formulation, Design, Analytical Testing, Consulting, Quality Systems, Regulatory Compliance, Regulatory Submissions, Training, Auditing and Marketing Expertise. Ceutical Labs is your “One Stop Shop” cGMP Compliance Specialists.